Yesterday afternoon Charlton played their final match of a very disappointing season. Apart from a screamer by Frederico Bessone that rocketed off the crossbar, and more than likely fractured it in the process, was of very few talking points. A 0-0 draw was an appropriate scoreline to finish with and sums the last nine months up a treat. One talking point had to be possibly the last Charlton appearance of Jon Fortune. It's always sad to see any player stretchered off with a major injury and it appears to be Jon's Achilles which has got to be one of the most painful of things to endure. I'm sure everybody wishes him a speedy recovery and back playing as soon as possible whichever club shirt he'll be wearing. Another event to note was the full debut of Callum Harriott. A young player who shows great promise for next season. Guessing by recent weeks, i expect that he is going to feature heavily in Chris Powell's plans. I'm hoping that John Sullivan will be as well. I had the pleasure of chatting to John's parents on the train from SE7 back to London Bridge. His time at Millwall has come to an end and he's hoping to discuss terms with the Addicks upon return from holiday. Of three or four clubs interested, Charlton are by far and away his first choice. If rumours about Rob Elliot and Newcastle are true, of which i stress i have no idea, we may well need a new number one. So as i clapped the squad off from their lap of honour, or more to the point, their lap of appreciation to the loyal support, i was saying goodbye to some for three months and some for good. There were however, a lot of hello's as well though yesterday. 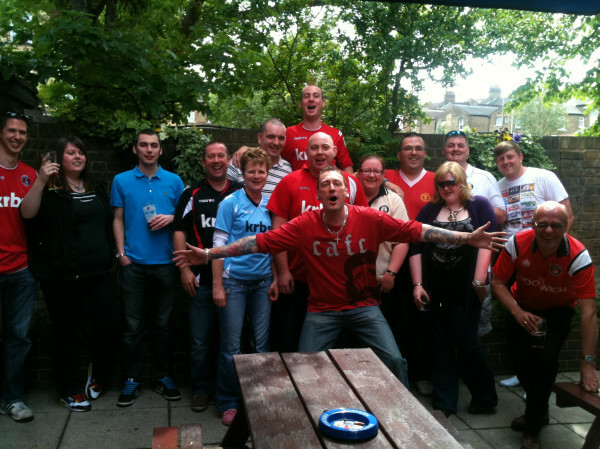 Before the match myself and Heidi arrived at The Rose of Denmark for a pre match drink or five. The picture at the top of this article shows how many of the CAFC twitter folk got together. It was wonderful to put faces to people i chat to every day, yet still very bizarre to all meet as friends without recognizing anyone.That's social networks for you. This is the modern age! Special mention must go to Bruce who i discovered went to the same school as me in Wallington, albeit ten years earlier. Another high was bumping into Mick Gebbett after the match. The name will be familiar to many of you as he was one of the supporters elected to the board of directors many years ago. It had been a long long time since I'd seen him and it was great to catch up with such a lovely bloke. It was as if no time had passed, but thinking about it, probably seven or eight years. A special mention to finish must go to the Hartlepool supporters. They took the challenge of fancy dress at your clubs last away game to a whole new level with a group of about thirty (educated guess?) Oompa Loompas. It was a special sight to see them with some Santa's (no idea why before you ask) bouncing in the Jimmy Seed stand arm in arm. Almost as funny was Heidi asking me why they had brought so many members of the boys brigade to the game. 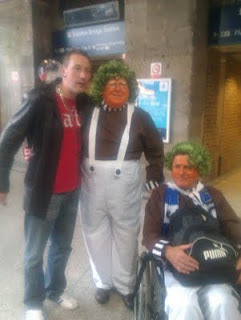 Two of them were even kind enough to have their photo taken with a certain drunk Londoner who pounced on them at London Bridge. Great lads!!! All Ommpa Lumpas had a fantastic Day & night thanks for your kind comments about the fancy Dress, Football is about enjoyment and we certainly did that. Credit to Charlton Fans for joining in the fun to.